Present century is the era of nanotechnology with its exciting and versatile field of applications towards mankind. 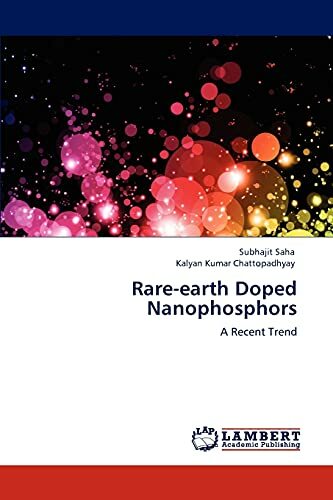 In unison, over the past decades, nanophosphors have been extensively investigated due to its enormous application potential for various high-performance novel displays devices, in non-linear optics and also in fast optical switching. Consistently, discovery of many rare earth materials played a prominent role to develop highly efficient luminescence materials. Surprisingly enough, intentional doping of these impurities (rare earth ions) in quantum confined (nanomaterial) regime explicitly enhances the emission efficiency of the phosphor materials. Thrust is still going on to find better nanophosphors, having high brightness and colour purity with lower excitation energy. Charge compensation by Li+ co-doping in the rare earth doped phosphors is one of the attractive and convenient tools to improve their brightness with high colour purity. So our sole interest is to enhance the brightness of nanophosphors; we contributed a little in this regard by co-doping Li+ in MgAl2O4: Eu3+ nanophosphor. Subhajit Saha, M.Tech (Nanoscience &amp; Technology), Jadavpur University, currently pursuing Ph.D. in School of Materials Science &amp; Nanotechnology of Jadavpur University, India.